Father’s Day can be challenging for the bereaved dad, just like Mother’s Day is for the bereaved mom. It only adds to the problem when fathers who have lost a child do not receive the support they need (but may not ask for) after their loss. This is not a fact I recognized around the time of Zachary’s passing, which I am sorry for. I was very introspective and self-focused back then, which is okay when you are trying to hold it together yourself. I still attempted to be there for my husband, though I’m not sure if I did a good job of it. My husband Aaron resumed life quickly after our loss, which at the time hurt me deeply. I felt abandoned by my partner and couldn’t see that he was grieving. Boy, was I wrong! I did not appreciate the deep undertow of male grief. I expected Aaron to express himself in the same way as me. Since then I have learned that everyone – not just men and women – grieve in their own unique ways. I recently published an excerpt from my book – obviously written from my perspective – and the corresponding chapter re-written through Aaron’s eyes. He worked with me on this, so I am not making up the male view on grief and marital struggle in the face of loss. Aaron has given his stamp of approval. It was very important to me that these chapters be shared around Father’s Day. My goal is to bring awareness to the male experience of loss. To give couples insight on their partner. To encourage men to speak out about their struggles. To prompt support for men after loss. Happy Father’s Day to Dads of all kinds, including bereaved Fathers. You can also read another article I wrote for The Good Men Project. It’s called: “He Said, She Said: One Couple, Two Perspectives on Grief” where Aaron and I answered questions about our loss, grief, and healing, but did so separately, then compared answers. Click here. Thank you so much for reading and sharing this information. I believe that we can change the way our culture thinks about loss by talking about our experiences in authentic ways. This ties into the “Healthy Grief Movement” that I am pioneering in my own slow-paced way. To that end, I would like to add a point to the manifesto list. I believe we can kick-start the “Healthy Grief Movement” in three key ways, though I recognize there are many more opportunities to take this idea and run with it. Thank you for reading Wanted Chosen Planned. This is a blog about life after the loss of a child, but it is also much, much more. It is a place to find resources and to create community. Sending out a virtual HUG this Father’s Day! P.s. 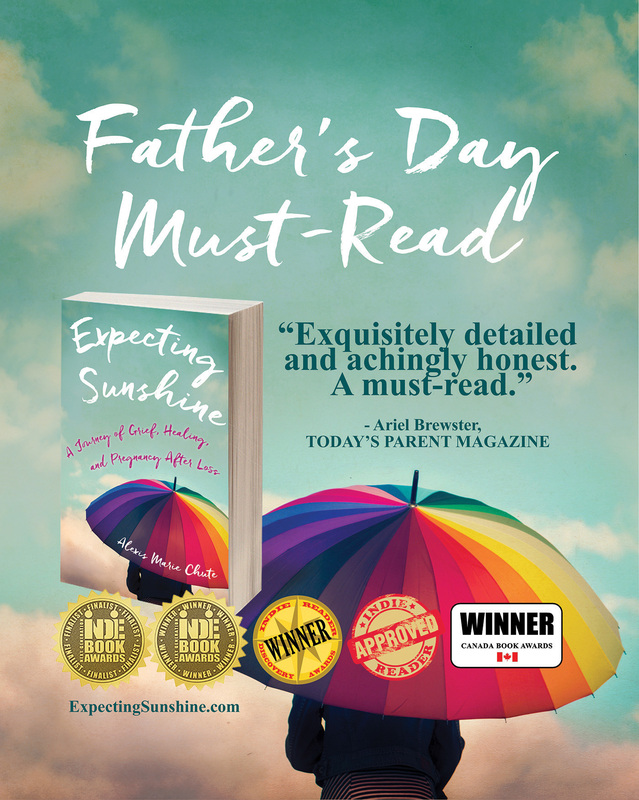 If you know a man that likes to read and has lost a child, check-out Expecting Sunshine. Sorry for this plug, but I do believe my book can help men, women, couples! For more info on Expecting Sunshine, click here. Click on the image to save and share. Thanks for helping spread the word!